The Vermont senator has given progressives leverage and a platform, a potent combination. 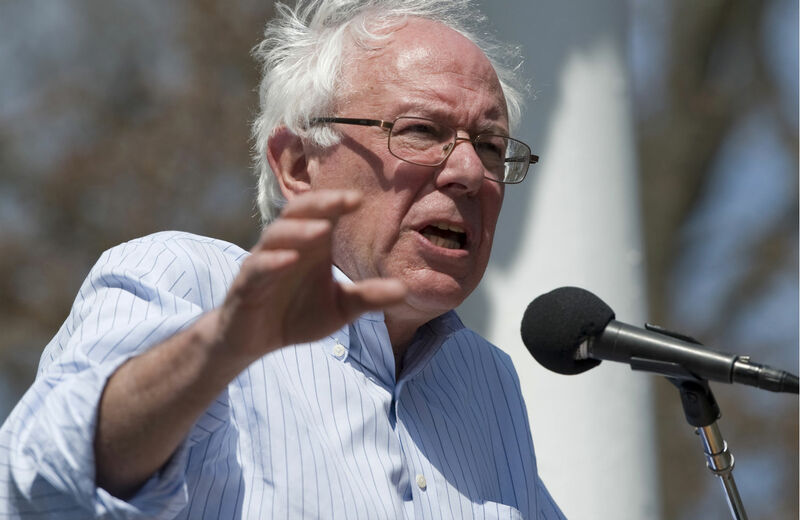 Northampton, Massachusetts—Senator Bernie Sanders is inching closer to deciding to run for president as a Democrat in 2016. When Sanders appeared in Northampton to celebrate the tenth anniversary of Progressive Democrats of America, and to honor the legacy of the group’s late co-founder and national director, Tim Carpenter, “Run, Bernie, Run” sentiment ran high. Carpenter’s last act was to collect 11,000 petitions urging Sanders to run as a Democrat. And nothing Sanders said discouraged the consensus. Thus a memorial service became an organizational birth, just as Carpenter himself envisioned. Nothing is decided until it is officially decided, of course, and pressures from the Democratic establishment are building quickly against the independent Vermont senator. Few if any Democratic elected officials are likely to endorse Sanders for fear of retribution from the formidable Hillary Clinton forces. Women’s groups, African-Americans, Latinos and Asians, Hollywood liberals and the organized labor are coalescing into a united front for Clinton too, and are sharply opposed to a potentially divisive primary fight with Sanders. But just as 2016 will be Clinton’s moment as a longtime feminist, it could also be Sanders’ moment as the only candidate challenging what he calls the “oligarchic force” with their vast powers over the economy, campaign finance and suicidal exploitation of fossil fuels. Sanders’ warning that democracy is threatened by the oligarchs resonates profoundly with millions of Americans looking for answers and for heroes. On the economic issues, it is predictable that a majority of rank-and-file Democratic voters prefer Sanders’ message on the economic crisis to the neoliberal formulas long supported by the Clintons. Those populist issues are not the only motivators in an election, but create a pre-existing base for a credible challenger, just as the Iraq War and Democratic silence propelled Vermont Governor Howard Dean to national influence in 2004. For the moment, Sanders is on a nationwide speaking-and-listening tour in which he delivers a long, detailed and educational stump lecture on the stranglehold of the oligarchy, adding a menu of general solutions: infrastructure spending, expansion of healthcare and education programs, repeal of the Citizens United and McCutcheon decisions, protecting civil liberties against a Big Brother surveillance state, and a rapid energy transition away from greenhouse gas emissions. Without detailing his foreign policy views, Sanders reminded the PDA audience of his opposition to the Patriot Act and the Iraq and Afghanistan wars. The Clinton forces currently dismiss the Sanders’ challenge, relying on an early monopoly of endorsements and money to project an aura of inevitability. But her advisers have reason to worry if she has to face Sanders in twenty to thirty debates where he will have a populist advantage with the voters judging them. In the Clinton style, she may hug the center with an eye on the fall general election, which could cause a dampening of ardor among the Democratic base. Assuming she wins the nomination, a lingering “Bernie factor” in states like Ohio could tip the November balance. The Karl Rove Republicans basically depend on fissures among Democratic constituencies to eke out victories for their unpopular Republican candidates. Sanders for his part has no interest in being seen as a spoiler who handed the election to the Republicans. He is registered as an independent (socialist) but caucuses with the Senate Democrats. If he runs as a Democrat, he will have to find a way to acknowledge Clinton as far better than any Republican candidate, while at the same time articulating a sharply different populist message. He could borrow Jackson’s ’80s strategic refrain that it “takes two wings to fly,” meaning that the Democrats are stronger if their progressive wing is strengthened against the Wall Street wing of the party. That increased progressive strength already is demonstrated in the electoral victories of Elizabeth Warren in Massachusetts and Bill de Blasio in New York City. California’s Jerry Brown has shown that it is possible to balance a budget, raise taxes on the ultra-rich, spend more on education equity, support immigrant rights fight global warming and win big. (Brown has endorsed Clinton, but is capable of running himself if an opportunity should happen to arise). One way for Clinton to marginalize Sanders or even push him out of the race would be to move closer to Sanders’ populist positions. Could the Clintons, who are famous (or infamous) for marginalizing the party’s left and realigning it with Big Money (NAFTA, deregulation, Robert Rubin, Larry Summers), actually swing back to the left in 2016? They may think that they don’t need to, because Clinton’s economic policies only need a bit of “refreshing,” and because a Hillary candidacy will turn into a referendum on women’s rights just as 2008 became a referendum on racism. They may be right if the Republicans cannot leash their mad-dog chauvinists. But if the nominee is Jeb Bush? The campaign then would seem to many Americans one over over dynastic succession, in which case the economic issues—and the “Bernie factor”—could become decisive. The Clintons already are on the image-makeover path, showcasing their endorsement of de Blasio (a former Clinton lieutenant), supporting a minimum wage increase and offering a positive gloss on their time in the White House. Would that approach sell in a debate with Sanders, or would she be hammered for tokenism and flip-flopping? In the background, her support of the Iraq and Afghanistan wars, drone and recent hawkish positions on Libya and Syria, lurk as sharks in the water she will have to navigate. Those issues can’t be dismissed like Benghazi, and they are issues which deeply matter to Democratic voters. Clinton emissaries of course could negotiate behind-the-scenes, starting now, with Sanders for major platform planks on the economy, climate change and campaign finance reform, even suggesting the vice-presidency to someone like Ohio’s Sherrod Brown, Virginia’s Tim Kaine or even Senator Elizabeth Warren, all enticing offers to Sanders’ wing of the party. But that would require an unusual recognition by the Clintons that the Democrats really do have a progressive wing that only grows more frustrated and stronger as the economy stagnates, emissions rise, wars loom ahead and right-wing fundamentalism becomes more toxic. In turn, such a tacit agreement would require a humility from Sanders that might begin to fade as he puts on the body armor of a challenger. A progressive third force (consisting of mainstream Democrats, the progressive base, populist insurgents and even libertarians) could take root as the best governing coalition possible in America. Can Clinton and Sanders imagine instigating a force larger than themselves in 2016? It’s a deep question. But without the growing whispers and rumors of a Sanders campaign, the question would not even be under consideration. The progressive agenda would recede as a possibility as maneuvering towards the center takes over the political stage. It is more likely that the issues will be sorted out the old-fashioned way, by the sweat and tears of one more fateful election. For now at least, Sanders has given progressives a leverage and a platform, a potent combination.